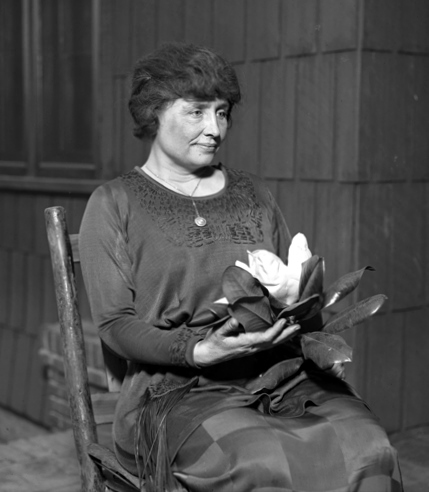 I asked that Miss Keller relate the steps by which she turned into the uncompromising radical she now faces the world as Helen Keller, not the sweet sentimentalist of women's magazine days. "I was religious to start with" she began in enthusiastic acquienscence to my request. "I had thought blindness a misfortune." "Then I was appointed on a commission to investigate the conditions of the blind. For the first time I, who had thought blindness a misfortune beyond human control, found that too much of it was traceable to wrong industrial conditions, often caused by the selfishness and greed of employers. And the social evil contributed its share. I found that poverty drove women to a life of shame that ended in blindness. "Then I read HG Wells' Old Worlds for New, summaries of Karl Marx's philosophy and his manifestoes. It seemed as if I had been asleep and waked to a new world - a world different from the world I had lived in. "For a time I was depressed" - her voice saddened in reminiscence- "but little by little my confidence came back and I realized that the wonder is not that conditions are so bad, but that society has advanced so far in spite of them. And now I am in the fight to change things. I may be a dreamer, but dreamers are necessary to make facts!" Her voice almost shrilled in its triumph, and her hand found and clutched my knee in vibrant emphasis. "And you feel happier than in the beautiful make-believe world you had dreamed?" I questioned. "Yes," she answered with firm finality in the voice which stumbles a little. "Reality, even when it is sad is better than illusions." (This from a woman for whom it would seem all earthly things are but that.) "Illusions are at the mercy of any winds that blow. Real happiness must come from within, from a fixed purpose and faith in one's fellow men - and of that I have more t+han I ever had." "And all this had to come after you left college? Did you get none of this knowledge of life at college?" "NO!" - an emphatic triumphant, almost terrifying denial - "college isn't the place to go for any ideas." "I thought I was going to college to be educated," she resumed as she composed herself, and laughing more lightly, " I am an example of the education dealt out to present generations, It's a deadlock. Schools seem to love the dead past and live in it." "But you know, don't you," I pleaded through Mrs. Macy and for her, "that the intentions of your teachers were for the best." "But they amounted to nothing," she countered. "They did not teach me about things as they are today, or about the vital problems of the people. They taught me Greek drama and Roman history, the celebrated the achievements of war, rather than those of the heroes of peace. For instance, there were a dozen chapters on war where there were a few paragraphs about the inventors, and it is this overemphasis on the cruelties of life that breeds the wrong ideal. Education taught me that it was a finer thing to be a Napoleon than to create a new potato." "It is my nature to fight as soon as I see wrongs to be made right. So after I read Wells and Marx and learned what I did, I joined a Socialist branch. I made up my mind to do something. And the best thing seemed to be to join a fighting party and help their propaganda. That was four years ago. I have become an industrialist since." An industrialist?" I asked, surprised out of composure. "You don't mean an IWW - a syndicalist?" "I became an IWW because I found out the Socialist party was too slow. It is sinking into the political bog. It is almost, if not quite, impossible for the party to keep its revolutionary character so long as it occupies a place under the government and seeks office under it. The government does not stand for the interests the Socialist party is supposed to represent." "Socialism, however is a step in the right direction," she conceded to her dissenting hearers. "The true task is to unite and organize all workers on an economic basis, and it is the workers themselves who must secure freedom for themselves, who must grow strong." Miss Keller continued. "Nothing can be gained by political action. That is why I became an IWW." "What particular incident led you to become an IWW" I interrupted. "The Lawrence strike. Why? Because I discovered that the true idea of the IWW is not only to better conditions, to get them for all people, but to get them at once." "What are you committed to - education or revolution?" "Revolution." She answered decisively. "We can't have education without revolution. We have tried peace education for 1900 years and it has failed. Let us try revolution and see what it will do now." "I am not for peace at all hazards. I regret this war, but I never regretted the blood of the thousands spilled during the French Revolution. And the workers are learning how to stand alone. They are learning a lesson they will apply to their own good out in the trenches. Generals testify to the splendid initiative the workers in the trenches take. If they can do that for their masters you can be sure they will do that for themselves when they have taken matters into their own hands." "Don't forget the workers are getting their discipline in the trenches," Miss Keller continued. "They are acquiring the will to combat." "My cause will emerge from the trenches stronger than it ever was. Under the obvious battle waging there, there is an invisible battle for the freedom of man." "I don't give a damn about semi-radicals!" "I feel like Joan of Arc at times. My whole becomes uplifted. I, too, hear voices that say 'Come', and I will follow, no matter what the cost, no matter what the trials I am placed under. Jail, poverty, calumny - they matter not. "Truly He has said, woe unto you that permits the least of mine to suffer." The true task is to unite and organize all workers on an economic basis, and it is the workers themselves who must secure freedom for themselves, who must grow strong. Nothing can be gained by political action. That is why I became an IWW.